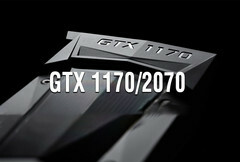 The GTX 1170 GPU is supposed to be powered by the same GT104 Turing 12 nm chip as GTX 1180, but it will come with lower specs that include ~1.5 GHz base clocks (1.8 GHz boost clocks), reduced CUDA core and TMU count, and slower GDDR6 VRAM. This means that the TDP could go as low as 140 W, which can make it a good target for crypto miners. Nearly a month ago, WCCFTech released the preliminary specs and benchmarks for the GTX 1180 GPUs that were largely based on last year’s Volta specs and performance data already available to the public. Even though they have not disclosed their insider sources, WCCFTech has recently published preliminary specs and benchmarks for the GTX 1170 GPU, which, of course, are subject to change before the official announcement that might happen during E3 next month. The new spec data reveals that the GTX 1170 will be using the same GT104 Turing chip that comes with the GTX 1180, but it will have a slightly lower CUDA core and TMU count and a tad slower memory. Thus, the GTX 1170 would integrate 2688 CUDA cores and 168 TMUs, and would still come with the now standard 64 ROPs. The core clock would be running at around 1.5 GHz, with boost clocks reaching around 1.8 GHz. As far as the video RAM is concerned, the GTX 1170 will benefit from as much as 16 GB GDDR6, but the 16 Gbps speed is most likely to get gimped down to 12 Gbps, reducing the bandwidth down to 384 GB/s with it, as well. However, the reduced performance also means that the TDP gets reduced to 140-160W, which could make it a good target for crypto miners. WCCFTech claims that the GTX 1170 expected performance is very similar to what the GTX 1080 Ti has to offer right now. The FP32 theoretical peak speed should reach 9.75 TFLOPS, which would make it 50% faster than the GTX 1070. 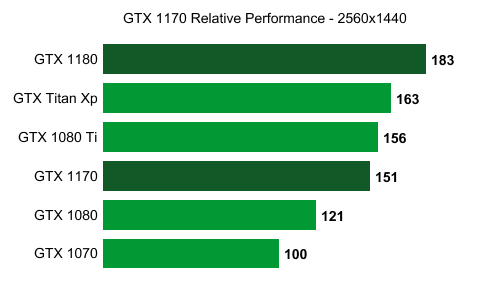 Looking at the performance chart for 1440p gaming provided by WCCFTech, the GTX 1170 is a few fps behind the GTX 1080 Ti, but it may actually end up faster, depending on the final core frequencies. Release date and pricing info is still speculated upon. The latest GPU price drops have definitely signaled that the next gen GPU series is almost ready to be launched, and the rumored July-August release seems more plausible than ever. WCCFTech’s unnamed sources say that the GTX 1170 would launch with a US$499 MSRP, which is around US$50 more than what the GTX 1070 cost at launch.